NEW BRITAIN - New Britain ROOTS is bringing a new type of recycling program to the city this summer. The local organization is offering an incentivized composting program this summer called MakinGreen. Through the program, participants buy a home food scrap collection unit from ROOTS with instructions on the types of food waste that can be collected for composting. Once full, containers can be returned to any mobile market location for collection. For every fully returned unit, participants will receive $5 in Bee Bucks tokens from ROOTS, which are redeemable at downtown farmers market vendors or ROOTS mobile market sites. According to ROOTS, the purpose of the program is to increase the number of people that recycle food scraps, diverting waste from traditional landfills that could otherwise be utilized in a sustainable way, such as composting. Composting ensures that the life cycle of manageable waste materials is not cut short and can continue to benefit the community on a larger scale through urban farming initiatives. MakinGreen will be the first food recycling program of its kind in the state, according to ROOTS. The collection program will operate out of the ROOTS Mobile Market and the New Britain’s Downtown Farmers Market, which begins today. The farmers market will be in Central Park from 11 a.m. to 2 p.m. every Wednesday through Oct. 24. 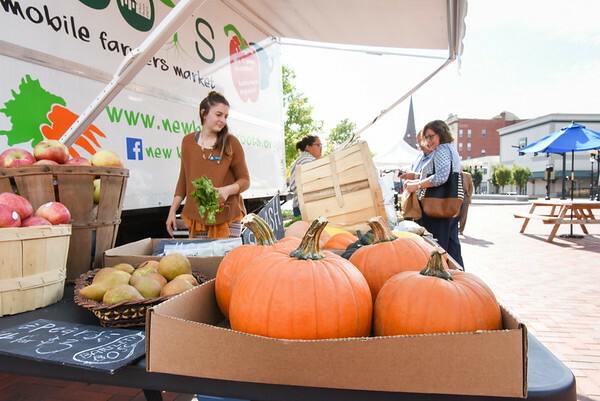 “I hope this program brings more people to the farmers’ market,” said Joey Listro, executive director of New Britain ROOTS. Collection units for the program cost $10 for a deposit, which is refunded at the end of the season if participants choose to return the unit. The program was made possible through a grant from the RecycleCT Foundation. To register for the program, call 860-259-4290 or email Joey Listro at joey@newbritainroots.org. People can also register by visiting ROOTS at any market location. More information can be found at www.newbritainroots.org . Posted in New Britain Herald, New Britain on Tuesday, 10 July 2018 20:15. Updated: Tuesday, 10 July 2018 20:17.